Maine's tourist-related business people will gather in Augusta Wednesday for the state's annual tourism conference. They'll hear from advertising and marketing specialist Kelly McDonald. In an interview earlier this week from Denver, Colorado, McDonald told Maine Public Radio's Morning Edition host Irwin Gratz that the factors that attract tourists these days go far beyond a comfortable bed and a good meal. McDonald's talk is titled, "Crafting the Customer Experience for People Not Like You." 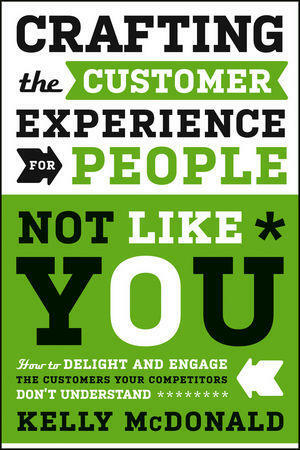 The cover of Kelly McDonald's book, "Crafting The Customer Experience for People Not Like You." GRATZ: Talk a little bit about how the marketplace in general has changed and become more diverse over the decades. MCDONALD: The first part is the part that we all know, which is that, you know, we're becoming more diverse as a population. And you can you can see it all around you with people who are of different races and ethnicities; you can hear it all around you with different languages that are spoken or different dialects. But my premise is that beyond that, everybody is sort of different from everybody, and in ways that we might not typically think of. For example, I don't have children, but most of the women that I know who are my age do have children. And if they're moms and I'm not, we're going to be different. We could be the same race, the same age. We could have the same household income, we could live in the same zip code. But if they're moms and I'm not, then we're going to be different in every way that is significantly meaningful - the way that we make decisions, spend money and what we prioritize. And the best businesses garner customer sales and loyalty by tapping into what different people value. GRATZ: So, it's really not a diversity based on things like age or race, but more diversity-based on experience? MCDONALD: Experience, and it's also values. Ultimately, what it comes down to is if I can figure out what you value and what's important to you, then I can figure out how to sell you, or if I can solve a problem for you. One of the things I'm going to talk to the audience about at the convention is “pain points.” You know, people will gravitate to the companies and businesses that help them solve their problems. So, here's a quick example: Ikea furniture - everybody who's ever shopped at Ikea loves their furniture, loves their style, the price, the way everything looks. But the problem has always been that Ikea furniture is awful to assemble. The New York Times even had a tongue-in-cheek article talking about how Ikea has been responsible for more couples breaking up than any other because they fight over assembling the furniture. So, I don't know what took them so long but they finally acquired TaskRabbit, and TaskRabbit now assembles the furniture. GRATZ: How about a couple of examples of companies that are doing this really well? MCDONALD: Doing good is the new cool. And everybody wants to buy products, buy services, state at hotels, go river rafting - all those things that they want to do on vacation or as part of tourism. But we also, secondly, care about sort of the soul of the company, if you will. And while all companies do good things, it's really important for brands and companies to merchandise what it is that they do. So, for example, the Maine Brew Bus actually has a feed kids initiative to help end child hunger in Maine. Now, that has nothing to do with beer, but it's the right thing to do. They've identified a situation in Portland with children who are hungry and they've said, “You know, that kind of speaks to us and we want to help with that.” And that's kind of the thing that I'm talking about - is when companies are smart and they say, you know, we know what matters to our customers is not just a good experience, but also that they feel good and leave feeling good.